Bannerghatta Neighborhood Association with support from ApnaComplex, conducted Waste Management Awareness and Best Practices Sharing Sessions on Saturday, 24th November, 2012. After a warm welcome from Mr. Sanjeev Bansal of Vithola Apartments, the event kick-started off with a small video on the WHY of Waste Management – the current status of Bangalore’s garbage dumps, BBMP’s diktats and securing the future for our children. 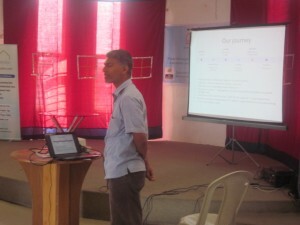 The Waste Management expert speaker sessions started with Waste Management for Dummies by Mr. Vijay Krishnan of RagPicker who gave a simplified, practical, down-to-earth explanation of WHATs of waste management. What were the different categories of waste, What are the composting options? What garbage goes into what bucket/bin/bag for disposal? What’s done with the garbage after it leaves our homes? 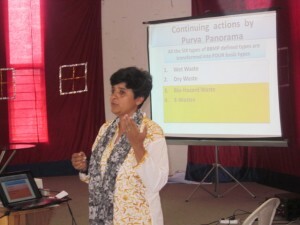 Wilma Rodrigues, the guru of Waste Management from way back in 2001, from Saahas group next presented some practical HOWs of Waste Management. 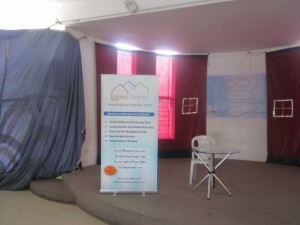 She explained about various tailored and customized options for apartments and gated communities in terms of services offered by Saahas. She explained how we can contribute back to not just environment by significantly reducing the output generated to landfills, but also giving back to the society in terms of employment for people manning the composting and segregation units right in the apartment/complex premises. The women and men employed with Saahas are given training, proper protection equipment and ergonomic tools and techniques to go about their mundane work. The services while being a big boon for societies who are always pressed for time and resources – is also very economical with charges only for covering the basic expenses. 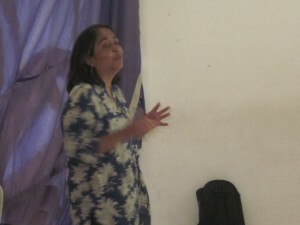 Up next was Ms Poonam of Daily Dump, another veteran in this area. Daily Dump, popular for providing eye-catching, colourful and beautiful composting units – be it for individual homes, society or office, was ubiquitously mentioned by almost everyone in the following Best Practices sessions. She gave some sharp, hard-hitting and thought provoking perspectives straight from the field – how to think of the bigger picture beyond just my home, my apartment, my backyard. For example how there was no CFL recycling plant in Bangalore and it needs to be transported several miles outside the city just for that. The Best Practices sessions generated the maximum question/answers from the audience with practical issues & tips shared by passionate committee members – Savitha from Sobha Azalea and Althea, Babita Saxena and Radhika from Ferns Paradise, Asia from Purva Panorama, and Anoop of Sobha Aster. Practical questions on how to change the mind set of maids, cooks and housekeeping (use incentives scheme, talk to them in the language they understand, use visuals instead of charts), how to practically collect wet garbage ( keep it newspaper lined buckets/bins outside your door and have the housekeeping staff empty it into larger trolley-bins), contacts of alternate conscientious waste collectors who actually don’t mix up after you have taken all the pains to segregate, how to mobilize the residents from indifference to active participants (go door to door, involve children, have fests, make garbage interesting!). This was the section that generated the maximum laughter and interaction too! What struck the audience was the professional presentation by these green champions. “Phased-implementation”, “Early Adopters”, “100% compliance”, “Soft Launch”, “Post Pilot” were some of the terms used by the presenters – which showed the corporate style commitment and execution towards making Bangalore a better place to live. 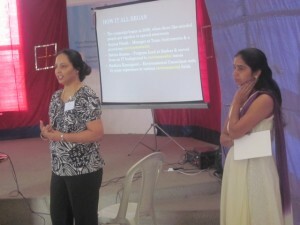 The event ended with an inspiring note from Ms. Lavanya of Youth For Seva. 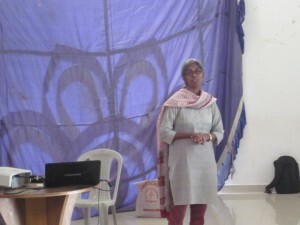 The finale session was most appropriate as she urged people to not just recycle – but also reduce. Take a moment before buying – do you really need it, can you get by with something more simpler option that we actually knew and used 10 years ago (do we really need that e-waste generating sensor activated liquid soap dropper? !, Do we really need black plastic refuse bags?). Once you buy it – take another moment before throwing it away – has it been used to fullest extent? Can you not repair instead of replace? Don’t fall for the consumerist marketing is the message she asked people to think about. YFS also has other areas of service such as health, education where volunteers can register and give back to society at large. A copy of Solid Waste Management Template for Apartment Complexes and an attractiveWaste Segregation Poster have been distributed to the participants. 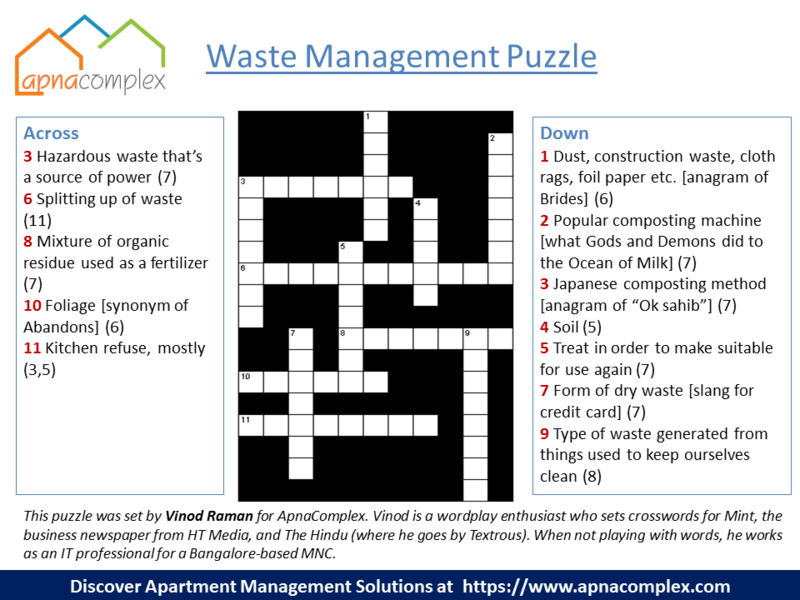 There was a crossword puzzle on Waste Management that was handed over to all participants and Mr. Manish from Klassik Benchmark has won the lucky draw for the same. “The sessions were very very useful. I have had lot of takeaways. 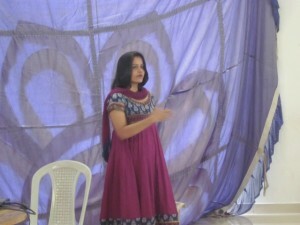 Although we were practicing Waste Management to some extent in our apartment, I have got lots of new ideas now and I am going to spread the word to not just my apartment but my entire neighbourhood” – words from the happy and satisfied member from the audience – Ms. Meeakshi of Ittina Abby sums it all. 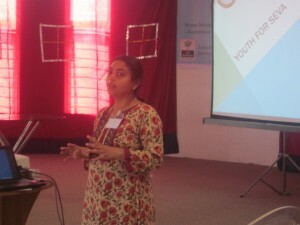 The sessions were attended by more than 60 participants from various housing societies. 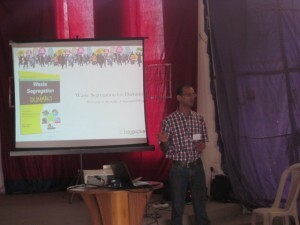 All presentations are available on ApnaComplex Slideshare.